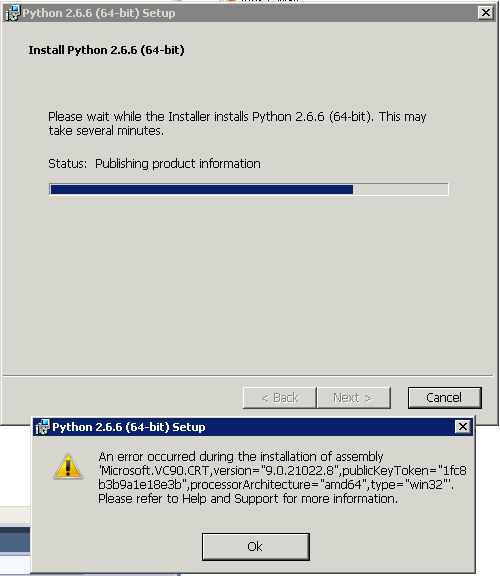 python-2.7.amd64.msi as well as python-2.6.6.amd64.msi fail to install on a Windows7-64 system. In both cases with: "An error occurred during the installation of assembly 'Microsoft.VC90.CRT,version=9.0.21022.8 ...'"
The installer succeeds with its automatic roll-back. python-2.7.msi (32bit installer) succeeds without any problems.